Archaeology is the scientific recovery and study of artifacts (objects made by humans) of past cultures. By examining artifacts and how and where they were found, archaeologists try to reconstruct the daily lives of the people of those cultures. Archaeological artifacts can include anything from ancient Greek pottery vessels found at the bottom of the sea to disposable plastic bottles found at modern dump sites. Thus, studies in archaeology can extend from the beginning of human prehistory to the most recent of modern times. Since the mid-twentieth century, as new laboratory technologies have become available, the number of disciplines or fields of study that are linked to archaeology have expanded. 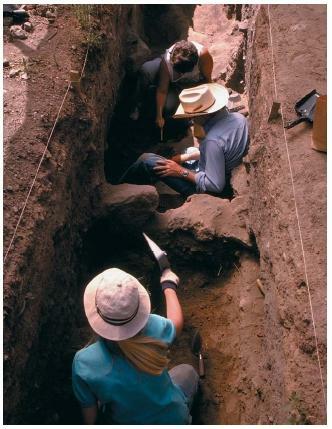 However, the individual field archaeologist tends to focus his or her research on a specific culture or era in time. Prehistoric archaeology. Prehistoric archaeologists seek to discover and write about the culture of ancient people who left behind no written history. Prehistory has no definite time period, having lasted for different times in different parts of the world. European prehistory ended with the appearance of primitive written languages around 2500 B.C. American prehistory, on the other hand, came to a close only 500 years ago when European explorers visited the New World and began keeping written reports of the people they had met. Historic archaeology. Historic archaeologists seek a detailed understanding of cultures that have existed between the end of prehistory and the recent past. Their studies of a particular culture are much more complex. They are able to examine artifacts as well as review written documents pertaining to the time and place of that culture. A relatively new subdiscipline of historic archaeology is urban archaeology. It attempts to understand our current culture and cultural trends by examining material found at modern dump sites. Classical archaeology: Archaeological research that deals with ancient history, ancient architecture, or any of the now-extinct civilizations, such as Greek, Egyptian, Roman, Aztec, or Mayan. 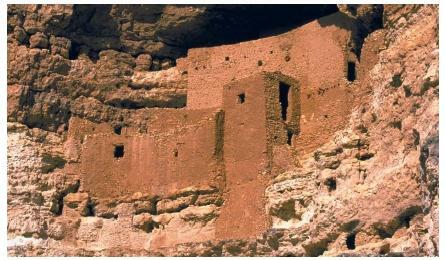 Historic archaeology: Archaeological studies focusing on the eras of recorded history. Prehistoric archaeology: Archaeological studies focusing on eras before the appearance of written languages. Classical archaeology. Classical archaeologists focus on the monumental art, architecture, and history of all ancient civilizations, including those of Greece, Egypt, and China. The roots of classical archaeology can be traced to the European fascination with Biblical studies and ancient scholarship. The classical archaeologist is perhaps the most popular public stereotype. The Indiana Jones movie character, for example, is based on the fantastic exploits of a classical archaeologist. by private individuals and wealthy collectors, broken artifacts were often left behind. Only intact and highly crafted items were thought to have any value. Consequently, very little was learned about the cultures that made those artifacts. Modern archaeologists are much more thorough in their research. They first survey or inspect the surface of an archaeological site to determine whether it might hold artifacts or other useful information about a culture. They then begin an organized excavation or digging operation to determine where the majority of artifacts are located at a site. Traditional tools used in excavation are picks, shovels, trowels, and hand-held shaker screens. To place artifacts in time periods, archaeologists use a variety of dating techniques. A basic field technique is to observe the stratigraphy, or the arrangement or layers of rock and soil, while digging at a site. Soil and artifacts are deposited and layered one above the other like the layers of an onion. Artifacts found at deeper layers are much older than those found near the top. Beginning in the late 1940s, archaeologists began to use radiocarbon or C-14 dating, a highly accurate dating technique. A small sample of organic (living) material found at a site, such as wood or bone, is analyzed in a laboratory to determine the time period in which it existed. In the United States in the late twentieth century, controversy arose over the archaeological excavation of ancient Native American grave sites. For archaeologists, graves have provided a very important source of knowledge about past cultures. Although the people of prehistoric North American cultures left no written history, they buried their dead surrounded with material goods of their time. Present-day Native Americans, however, believe ancestral graves should not be disturbed. If they are, then any remains and artifacts should be buried with ceremony. In response to Native American concerns, the U.S. government passed the Native American Grave Protection and Repatriation Act in 1990. This federal law penalizes anyone selling or trading illegally obtained Native American human remains and cultural items. It also requires all museums and universities that receive federal funding to repatriate or give back their Native American collections to tribes who claim cultural or religious ownership over those materials. Archaeologists have countered that, in many cases, it is almost impossible to link ancient materials with modern Native American cultures. They also argue that museum materials are part of the heritage of the entire nation. Giving these materials back will prevent any further studies from being conducted in the future.